5 Bedroom Detached House For Sale in Rye for Offers in excess of £675,000. This stunning detached village home provides a real slice of English history with all its Georgian architecture and 17th/18th Century origins. Set back from the road behind a yew hedge and pollarded lime trees, this family home provides 5 double bedrooms with 3 reception rooms, 3 bath/shower rooms, one en-suite, together with a study, farmhouse kitchen and a butlers pantry which including the attached boot room, workshop and stable extends to around 3036 sq ft. A detached quadruple garage, with storage above, utilizes the old barn and adds a further 518 sq ft of floor area, which, together with the attached outbuildings and log store, forms a large courtyard drive to one side of the house with access to the mature gardens to the rear, including a part walled garden. On the other side of the house an orangery and a large bay window over look and give access to the front, side and rear lawns. The house is set within grounds of approximately 1 acre with a blend of formal flower beds, orchard, park/meadow and woodland. 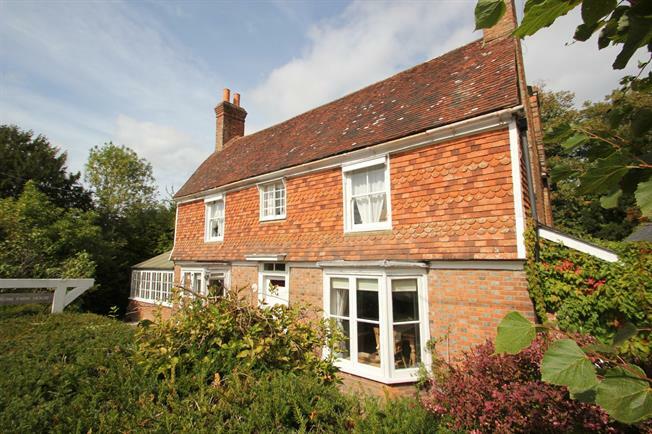 A beautiful detached village home with the main portion dating to the Georgian era with with 17th century origins. The property has benefitted from a Victorian side extension and provides generous proportioned rooms over three floors to include an entrance hall with stairs ascending to the first floor, three ground floor reception rooms as well as the kitchen with Rayburn, a study, bathroom with freestanding cast iron bath and the Orangery. To the first floor there are three double bedrooms and a shower room - the master bedroom benefitting from an en-suite and dressing room. To the second floor you will find two further double bedrooms. The house sits in a generous plot of approximately one acre offering landscaped gardens with lawn areas, mature borders and flower beds. A partially walled garden has been created in recent years and there are a selection of old apple trees to the rear. A range of outbuilding are attached to the house and offer a workshop, 20ft stable and storage space. The driveway is graveled and accesses the quadruple garage which has a room above and log store to the side. The property is located within the village of Peasmarsh with access to local amenities including village primary school, Jempsons independent supermarket with sub post office, public house and bowls club. Within three miles to the south is the Ancient Town and Cinque Port of Rye with its period Citadel with cobbled street and period architecture, local independent shops, banks, schools for all ages and rail services to Hastings and Ashford with high speed connections from the latter to London St Pancras in 38 minutes or the Continent. Other towns in the region include Tenterden with its tree lined High Street, Battle with its historic Abbey and Hastings with its seaside promenade.